Cimex-Encap Carpet Cleaning System is a revolutionary, high productivity, cost effective, low moisture carpet cleaning system. The system features state of the art polymer chemistry that encapsulates dirt for clean carpets that stay cleaner for longer. Cimex-Encap builds on this experience to provide one of the simplest and most effective commercial carpet cleaning processes available. Thorough vacuuming before using Cimex-Encap ensures all dry soil is removed. Removing the dry soil enables the Cimex-Encap process to more effectively attack the sticky/oily soil left in the carpet. Cimex-Encap is a polymeric carpet cleaning solution that is applied to the carpet via a Cimex Cyclone three brush machine. The solution releases sticky soil from the carpet fibres and then traps or “encapsulates” the soil as it dries. Cimex-Encap is a low moisture system so carpets dry rapidly. For the encapsulation chemistry to work fully, leave the carpet to dry overnight before vacuuming. 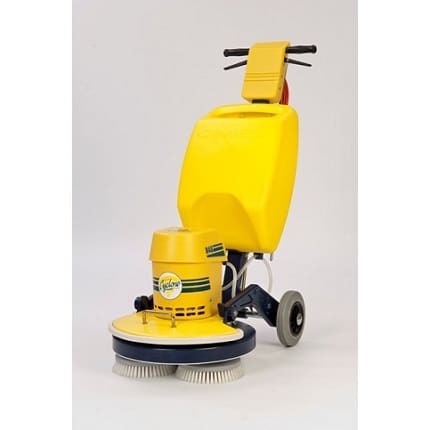 The Cimex-Encap process is completed by vacuum cleaning. Encapsulated soil is simply removed from the carpet with normal routine vacuum cleaning. Cimex-Encap restores cleanliness and brightness to even the most heavily soiled commercial carpet. Cimex-Encap has the added benefit of ensuring that once a carpet has been cleaned that it will stay clean. Cimex-Encap Low Moisture Carpet Cleaner attacks all soils commonly found in carpets. It’s unique formulation emulsifies the soil and then, using the latest chemistry, encapsulates the soil for easy removal. Low moisture technique means fast drying times – carpets are normally dry to the touch in 45 minutes to 2 hours. Cimex-Encap Spotter is the only spotting solution designed to work with the Cimex-Encap system. It can also be used to pre-spray stubborn stains and high traffic areas for even more effective results. Cimex-Encap Spotter works on both water and oil-based spots and spills. Cimex-Encap Pads provide the most effective application of the Cimex-Encap solution when cleaning low pile commercial carpets. The pads provide greater contact area than the brushes which helps achieve enhanced agitation of the carpet fibres.